Known as the Reformation, this famous split from the Roman Catholic Church spawned, among other things, Protestantism. The reformers included Martin Luther, John Calvin, Huldrych Zwingli, and Gustav Vasa, among others and was furthered by the new invention, the printing press. In the 16th century, the Protestant Reformation began the movement which attempted to reform the practices of the Catholic Church. Driven by Martin Luther, John Wycliffe, and John Calvin, among other Christians of the day, it caused a wide and historic wedge in the Christians of that day, and spawned Protestantism. Or perhaps it is better stated that the movement further widened the chasm which had begun in the 1378. The Papal Schism caused a split in the Roman Catholic Church in the late 14th and early 15th centuries which was caused after two men claimed to be the "true pope." After the death of Pope Gregory XI, Pope Urban VI was elected. He turned out to be a man with anger issues, as he was prone to violent outbursts of temper. Reportedly, when the cardinals learned of this problem, they believed Urban to be insane. This might have been due to the fact that the angry Pope declared that the business of the church would no longer run on gratuities and forbade the cardinals to accept the annuities to which they had become accustomed. Less than six months later, the majority of the cardinals who had voted him in declared his election invalid and elected militant cleric Robert of Geneva, the commander of the papal troops. Robert of Geneva, known infamously as the antipope -- and said by some in his day to be the Antichrist -- took the name Clement VII, and excommunicated Pope Urban. Thus was born the first part of the schism. It went on long after both Urban and Clement were dead, with each faction electing their own popes. This was finally ended by the Council of Constance in 1418, but the although the bleeding stopped, the wound never closed up. Fast forward to 1517, when Martin Luther, a German monk, Catholic priest, and theology professor, taught that salvation was not earned but was a free gift of the grace of God through faith in Jesus and that the bible is the only source of the word of God. And he denounced the Catholic Church's practice of buying indulgences, essentially on the premise that God's wrath could be quelled with the donation of money to clerics. He wrote "The Ninety-Five Theses on the Power and Efficacy of Indulgences," a disputation which enumerated his objections to Catholic practices regarding absolution, baptism, and the idea of indulgences even when not sold. Luther argued that salvation was granted by faith alone, and that the bible, not the Pope, is the way to understand God's word. In 1518, Ulricht Zwingli began his pastoral duties in Zurich, Switzerland, where he preached about the necessity of reforming the church. 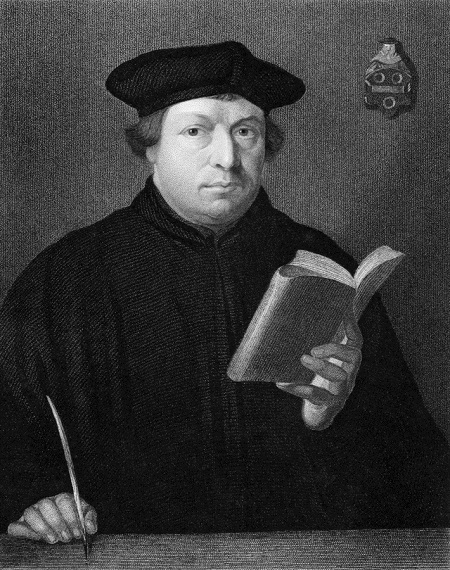 In 1520, Pope Leo X demanded that Luther retract his writings, and when that did not happen, he excommunicated Luther. The next year, he was condemned as an outlaw by the Holy Roman Emperor Charles V. This served to alienate those who would become reformers in the near future. In 1522, Zwingli loudly and frequently denounced the traditional fasting during Lent until Easter. He wrote about the use of images in churches, equating them with idols and church-goers in those churches idol worshipers. He also spoke out against the idea that priests should not marry. His zealous theological pontifications split Switzerland, with some of the cantons embracing the Reformation, while the other half sided with the Catholic Church. The two sides came a hair's breadth from war, which was barely averted in 1529. Simultaneously, Henry VIII joined the Reformation, though not exactly for theological reasons. He removed the Church of England from the authority of the papacy after Pope Clement VII refused to grant him an annulment from Catherine of Aragon, who gave birth to only one surviving child: a girl. It was during this time period that Martin Luther began to hear about what was going on in Switzerland, and they met, with seven other leading reformers, at Marburg Castle in Hesse, Germany, which became known as "The Marburg Colloquy." It was there that the Reformers sought to unite the Protestant theology. Protestant churches began to be born and thrive, with the Unity of the Brethren (Unitas Fratrum) and the Moravian Church among the first. The Lutheran Church thrived in Germany, Scandinavia, and the Baltic nations. Reformed churches cropped up in France, Switzerland, Germany, the Netherlands, and Scotland. The Thirty Years' War was one of many results of the Reformation. The last major religious war in continental Europe, it began as a war between Catholics in the Holy Roman Empire and Protestants, whose movement had grown over the decades since it began. The foraging armies caused disease and famine as they aggressively foraged central Europe, causing the deaths of significant numbers of the citizenry of the the Dutch Republic, the Kingdom of Spain, the Republic of the Seven United Netherlands, France, Sweden, and their allies, most of whom had gone broke during the three decades of fighting. The Peace of Westphalia ended the War, and for the most part, the Reformation. It also took away the Pope's political power, causing Pope Innocent X to call the treaty "null, void, invalid, iniquitous, unjust, damnable, reprobate, inane, empty of meaning and effect for all times." Displays a chart of notable leaders in the Reformation, and each of their portraits, birth and death years, cause of death, associated tradition, and published works. he Protestant Reformation is viewed from the perspective of its affect and influence on the Jewish religion during the 16th Century. Covered are such topics as the sale of indulgences, Martin Luther and the 95 Theses, Luther's attitude toward the Jews, and the effect of the Reformation on the Jewish people. Outlines the Reformation, including the causes, the ideas and purposes of the reformers, how the movement spread, and results as well as consequences. Dr. Hans Rollmann presents documents relating to the Reformation, including selected works of Martin Luther, the Augsburg Confession, the 95 Theses, a Treatise on Good Works, and others, as well as those of Phillip Melanchthon, John Calvin, Ulrich Zwingli, Heinrich Bullinger, and those of the English/Scottish Reformation, the Mennonites, and the Counter Reformation. Although the purpose of this site is to restore the reasons behind the Protestant Reformation today, the site includes a history of the 16th century events known as the Reformation, as well as the people who were behind them. Part of a lecture series about early modern European history, this is a lecture about the Protestant Reformation. It begins with the historical factors which led up to the reformation, the struggle, and the results. Presents a profile of Martin Luther, including his early life, his attempt to find peace with God, and his translation of the New Testament into German. Also looks at his theories of grace, indulgences, and the response of the Roman Catholic Church to his actions. Martin Luther, John Calvin, and others of the leaders of the Protestant Revolution are highlighted, along with Anabaptist leaders like Conrad Grebel and Menno Simons, particularly in the manner in which these men contributed to change in the Christian church. Contains numerous resources a bout the 16th Century Reformation, including books such as the Blackwell Companion to Protestantism, New Westminster Dictionary of Church History, and numerous introductory texts. Search for Protestant Reformation on Google, Bing, or Yahoo!